Jimmie Johnson prepares to head out for STP 500 practice on Friday at Martinsville Speedway. Martinsville Speedway has been the site of many triumphs for Hendrick Motorsports, which as a team has won 20 races here, including its first NASCAR Sprint Cup Series race with Geoffrey Bodine in 1984. 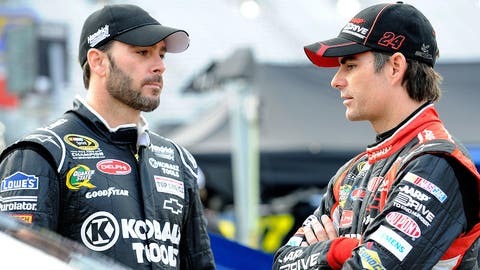 But the track was also where the team suffered its greatest loss — a Hendrick team plane crashed on the way here in the fall of 2004, claiming the lives of 10 people, including team owner Rick Hendrick’s only son, Ricky, and Rick’s brother, John. 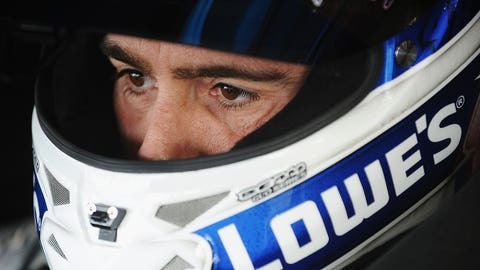 It was a devastating tragedy, one that six-time Sprint Cup champion and Hendrick Motorsports driver Jimmie Johnson still thinks about occasionally. "It just depends on what activates my mind," Johnson said Friday morning at the 0.526-mile track. "Like today, I flew up. It’s overcast. It’s cloudy. The whole week leading into Martinsville, I’ve been excited about coming here to race and feel like we have a great chance to win. I wake up this morning and it’s overcast, and I can’t help but think of the airplane incident. It just kind of depends on what triggers the thought process." Johnson was the race winner on that day in 2004 and was not made aware of what happened until after the race. "Certainly, the day that it happened, I look back on that day a lot and think about how things went down," said Johnson. "NASCAR called all four (Hendrick) cars to pit lane. We get to pit lane, and there are police officers standing around our cars, and I’m like, ‘What in the world has happened?’ Normally there are NASCAR officials not police officers. I walk through that from time to time. I hope to never ever go through anything like that again."